Look! Sugar-free heartburn relief. Ranitidine tablets 150 mg. Prevents & relieves heartburn associated with acid indigestion & sour stomach. Easy to swallow with water. Cooling sensation in mouth & throat. 65 doses. This product is sodium and sugar free. Active Ingredient (In Each Tablet): Ranitidine (150 Mg) (As Ranitidine Hydrochloride [168 Mg]). Inactive Ingredients: Carrageenan, Fd&C Blue 1, Flavors, Hypromellose, Magnesium Stearate, Microcrystalline Cellulose, Polyethylene Glycol, Polysorbate, Sucralose, And Titanium Dioxide. Read the directions, consumer information leaflet and warnings before use. Keep the carton. It contains important information. Adults and Children 12 Years and Over: To relieve symptoms, swallow 1 tablet with a glass of water. To prevent symptoms, swallow 1 tablet with a glass of water 30 to 60 minutes before eating food or drinking beverages that cause heartburn. Can be used up to twice daily (do not take more than 2 tablets in 24 hours). Children Under 12 Years: Ask a doctor. Avoid excessive heat or humidity. Store at 68-77 degrees F (20-25 degrees C). Allergy Alert: Do not use if you are allergic to ranitidine or other acid reducers. Do not use if you have trouble or pain swallowing food, vomiting with blood, or bloody or black stools (These may be signs of a serious condition. See your doctor); with other acid reducers. Ask a doctor before use if you have frequent chest pain; frequent wheezing, particularly with heartburn; unexplained weight loss; nausea or vomiting; stomach pain; had heartburn over 3 months (This may be a sign of a more serious condition); heartburn with lightheadedness, sweating or dizziness; chest pain or shoulder pain with shortness of breath; sweating; pain spreading to arms, neck or shoulders; or lightheadedness. 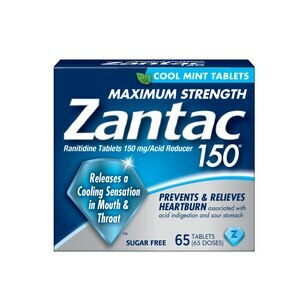 Stop use and ask a doctor if you heartburn continues or worsens; you need to take this product for more than 14 days. If pregnant or breast-feeding, ask a health professional before use. Keep out of reach of children. In case of overdose, get medical help or contact a Poison Control Center right away. Do not use if individual blister unit is open or torn.